My client was in tears. Fitting in is an attempt at making yourself who you think others want you to be. Belonging is showing up fully as your complete messy + lovable self. She was confusing fitting in with belonging, which is what she really wanted. She is a mid-50s successful + intelligent women who has her own business, good friends, a supportive + caring spouse and has launched her kids out into the world. Yet even she suffers in some areas of her life, the deep sense of not being ENOUGH. And with this particular group of friends, she was triggered and feeling desperate. Her desperation sought immediate gratification at any cost – even if that meant selling herself out to fit in to what others wanted her to be. She had been worried. If she didn’t drink the glass of wine, she wouldn’t be accepted. Thus the downward spiral of not doing what others expected of her. Then came the old compare and despair. Which friends were more liked than her? Which friends were more popular than her? Which friends got more invites than her? This all lead to an increase of self-beatings. What is wrong with me? Why aren’t I good enough? And then final tipping point, desperation and willingness to sell oneself out by drinking what didn’t feel good to her body, in order to fit in. Now, in her coaching session, as she got grounded and out of this desperation, she began to realize she didn’t want to fit in, she wanted to BELONG. This means being exactly who she is (authentic) regardless of whether or not she has a glass of damn wine! This means being her own badass self and truly connecting with her friends! This means refusing to evaluate her worthiness based on other people’s opinions, and instead owning her worthiness! This means stopping any comparing and despairing, as she knows this is only leads to unhappiness for her! Next time you find yourself trying to fit in, remember that what we all really want is to belong. You don’t have to hustle to earn true belonging. Be YOU, it’s way more enjoyable. 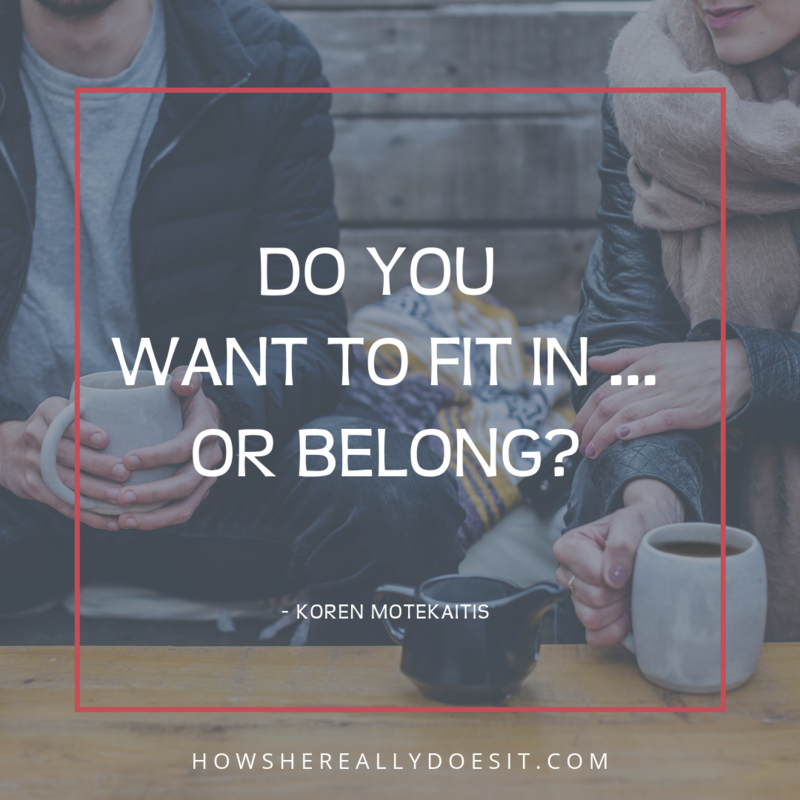 If you, like my client, are struggling with a deep sense of not being enough, of trying to fit in instead of belong … I’ve got something I’d like you to take a look at.